Bharatiya Janata Party (BJP) president Amit Shah on Friday said dubbed the Prime Minister Narendra Modi led-National Democratic Alliance (NDA) government is a reformist government. Addressing a press conference here to mark the first day of the M.O.D.I. (Making of Developed India) fest to celebrate the three years of Modi government, the BJP president outlined the various reformist steps taken by the Centre. Shah said that Modi government is keen to end the use of black money in the electoral process and politics. 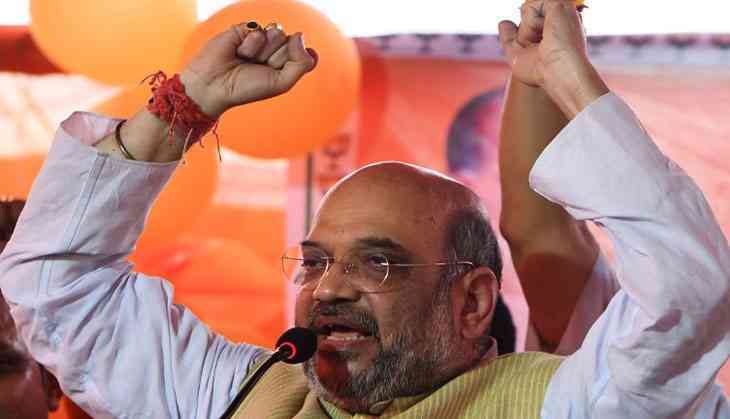 "In order to end the use of black money in the politics, the Modi government reduced the limit of cash donation to political parties from Rs 20000 to Rs 2000," said Shah. He said that the Prime Minister is desirous of bringing reform the way elections are being conducted in the country. "The Prime Minister has expressed desire that all the elections from the panchayat level to the Lok Sabha should be conducted on a single day. He has given this suggestion to all the political parties and opened the subject for a debate," said Shah. Talking about the other reforms, the BJP president said that the Modi government has repealed 1100 irrelevant laws. The BJP leader also pointed out that by banning the use of red beacon, the Modi government has ended the V.I.P. culture in the country. He said the BHIM (Bharat Interface for Money) has become one of the most popular mobile app in the field of digital transactions. "Linking the APP's name with Bhim Rao Ambedkar, Modi government has brought forward the economist qualities of Ambedkar," said Shah. He further said that the NDA government has supplied electricity in 13000 villages out of the 18000 villages that didn't have power. Ghayal Once Again: Why was the release date of Sunny Deol's film delayed?